Edinburgh Capitals were beaten 4-1 by a resurgent Manchester Storm in a chippy contest at Murrayfield last night. Match referee Toby Craig earned his fee, handing out 100 minutes in penalties as tempers boiled over. In the end, a depleted Edinburgh lost their 13th consecutive game, whilst Manchester picked up their eighth win in their last nine matches. Caps player-assistant coach Jacob Johnston, out since the turn of the year with a season-ending knee injury, commended his side’s work effort but admitted the visible lack of depth in the Edinburgh squad is a key factor in the club’s horror run. Edinburgh never really looked like getting back into the game after Storm player-coach Omar Pacha scored Manchester’s fourth goal with 18 minutes to play, despite three minutes of five-on-three power-play time. The majority of that had been triggered when Storm’s Latvian internationalist Ricards Birzins lost his cool with Edinburgh’s Callum Boyd. What looked like a harmless collision in the 43rd minute resulted in Birzins landing heavy punches on a crouched Boyd. Edinburgh lost defenseman Kyle Bigos, who was having one of his best games for the club, on a game penalty for third-man-in after he stepped in to protect his team-mate. Edinburgh could do nothing with the five-on-three power-play that resulted from the fracas and Johnston continued: “With the injuries and stuff that’s been going on there is an issue with depth and that’s hurting us, especially in key moments like that power-play. Edinburgh out-shot the visitors 36–29, and although Storm goalie Zane Kalemba played a very sold game, Manchester created far more clear-cut opportunities and could have scored more were it not for a combination of poor finishing and some top point-blank saves from Edinburgh goalie Carsen Chubak. Edinburgh got off to a terrible start, Storm catching the Murrayfield men cold after just 45 seconds. Matthew Sisca profited from some poor defending and Chubak lost his bearings to end up out of position. Caps, first minute blip apart, competed well in the opening period and deservedly equalised with a Bigos power-play goal in the 13th minute. But parity lasted all of 90 seconds with Manchester making it 2-1 after some slick passing scythed through the Capitals defence, giving forward Matt Paton an easy finish. The second period was by far the most one-sided of the game. Manchester dominated in terms of quality chances but had only one goal to show for it, scored on the power-play. GB internationalist Matthew Davies tipped a Birzins long-range effort past Chubak just after the half-hour mark. 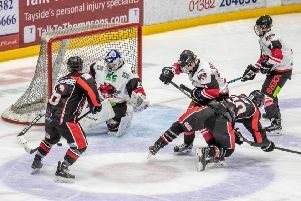 Edinburgh fired 16 shots on the net in the final 20 minutes, however most were from range and comfortable for Kalemba whilst Chubak could do nothing about Pacha scoring Storm’s fourth, scrambling the puck home on a delayed penalty after Edinburgh’s Kyle Flemington had been called for cross-checking.